after the specified battery life has expired, or any other cause. use of this product and any of its functions, such as stolen credit card numbers, the loss of or alteration of stored data, etc. coffee, steam, perspiration, etc. will also cause malfunction. • Unless otherwise specified, the text material applies to ALL 3 models. 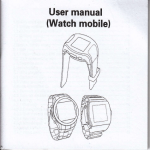 • Some of the models described in this manual may not be available in some countries. Organizer for the first time. happens, press the RESET switch. RESET switch and then release ON . “CLEAR ALL DATA OK (Y/N) ?” is displayed. the condition of use.) Press ON to resume operation. memory”. Proceed to the next step in either case. object. Do not use an object with a breakable or sharp tip. or it may not function if the battery level is very low. • The Backlight does not function during data transfer. significantly reduce the life of your batteries. properly until the batteries are replaced. 1. Press 2nd MENU NEXT 3 .
interval (15 – 60 seconds). 1. Press 2nd MENU 3 .
and “ ”, press the desired key after pressing 2nd . → 2nd MENU : Indicates the MENU key. : Indicates the alphabetic Q key. are shown as unboxed numbers and letters. EDIT : The listing on the display can be edited. keypad can be used next. down) , , , or . or : after pressing 2nd . : More information exists above the current display. : More information exists below the current display. BATT : Indicates that the operating battery level is low. • The first display is determined by your previous choice. stored and displayed on this display. Press INS again to change the cursor from “ ” to “■”. Press DEL or BS to delete the character. the desired date and time between Jan. 1, 1901 and Dec.
value and press ENTER again. its zone number is 23. 2. Press 2nd EDIT to enter the edit mode. • “18” on the display indicates the time zone. 4. Press ENTER to set the Home city. • Zone numbers 0, 14, and 15 have no city name display. 2. Press 2nd EDIT . 3. Enter the hour and minutes. 4. Enter the month, day, and year. 5. Press ENTER . The clock starts from 0 seconds. this example, set the 12 hour clock. corresponds to the desired zone. 3. Press NEXT (or PREV ) to set the zone number to 12.
move the cursor to the city name line. time is advanced one hour during the summer. clock, it does not have to be set for the World clock. 4. Press 2nd ENTER to set the time as DST. 2. Press 2nd EDIT , then 2nd ENTER . displayed in the World clock. follow the steps 1 and 2 for World clock. listing is 512 in all. listings respectively in each order on the display. convenience by using one for business and one for personal. The files are cycled each time you press TEL or E-MAIL . MAIL1, then press ENTER . • To cancel entering the filenames, press C•CE twice. 1. Press TEL to display the TEL/MAIL1 entry prompt. The number entry prompt is displayed. The REMARK entry prompt is displayed. entries: name, URL, and remark. that can be entered for each listing is 512 in all. • You can edit “www.” if necessary. between Calendar and Schedule modes. NEXT : display the following (or previous) month. scrolls into the previous screen. Press 2nd SCHEDULE in Calendar mode. between Schedule mode and Calendar mode. A schedule listing consists of 3 entries: date, time, and detail. digits each for the month, day, hour, and minute. • Multiple listings can be scheduled on the same date. detail is the same for all 3 ways. calendar for the current date (February 8, 2001). • You can enter schedule details without the ending time. System of the MENU functions. time and follow the next procedure. <Example> Enter a schedule listing on February 11, 2001.
the current date (February 8, 2001). in Calendar mode” (from step 4) on page 13.
this way is more convenient than the above 2 ways. <Example> Enter a schedule listing on November 26, 2001. The maximum number of characters for each memo is 512.
sounds when a “ ” is on the display. to turn the “ ” on and off. classify or declassify each listing. • Press C•CE to turn the alarm off. between Memo and Anniversary modes. birthdays, so that you can recall these important dates easily. anniversary for every year from 1901 to 2099. The maximum number of characters for each label is 512.
the date in the monthly calendar. Clock, Calculator, or Conversion mode. briefly and the display returns to the entry prompt. Recalls listings in order in each mode. order has been found, “NOT FOUND !” is displayed briefly. 2. Press NEXT (or PREV ). displayed date in forward (or reverse) order. check if the other listings are scheduled for today. Telephone/E-mail, WWW, Schedule, or Memo mode. 1. Press TEL to display the TEL/MAIL1 file. 3. Press 2nd NEXT . <Example> Recall the calendar for December 25, 2001.
press C•CE to clear the displayed date. 3. Enter the month, day, and year. press NEXT (or PREV ). 1. Recall the listing to be edited. 2. Press DEL . “DELETE ? Y/N” will appear. 3. Press Y to delete the currently displayed listing. without deleting the previously stored listing. • To cancel the deletion operation, press N .
Refer to “4. Deleting the Data” on page 26.
deleted, anniversaries are still retained. 3. Press C•CE to display the entry prompt. A “ S ” indicates the Secret function is in effect. written record of the password. “PASSWORD  IS NOW SET” is displayed. Secret function is now off and secret listings can be recalled. The display changes into the entry prompt without the “ S ”. changes into the entry prompt. cannot be recalled unless the Secret function is off. procedure and store the listing. The listing for “Edwards Bob” is now designated as secret. 3. Press 2nd EDIT . Perform recalling (or editing) secret listings in each mode. 3. Press 2nd MARK . The “ ” is displayed. 4. Press 2nd NEXT (or 2nd PREV ). Press CALC/CONV once or twice to select Calculator mode. between Calculator and Conversion modes. 1. Turn the Secret function off. 2. Press 2nd SECRET . 3. Press 2 to select “2 : DELETE THE PASSWORD”. 4. Enter the old password to be deleted and press ENTER . display changes into the entry prompt. described in “1. Registering a Password” on page 20. The Organizer can calculate numbers up to 12 digits long. CM to clear the display and memory. C•CE to clear the error. currencies and units in the Organizer are factory installed. for items No. 4 to No. 6 cannot be changed. 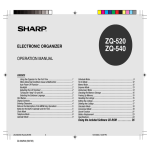 • The Organizer can calculate numbers up to 12 digits long. that the rate is to be set for. • The rate can be entered up to 10 digits long. and when you press NEXT to select the conversion No. the unit name, you can also set the rate at a time. The cursor will flash on the rate field. to move the cursor to the unit name field. position and enter the new unit name. approximately 1 minute. Press C•CE to turn the alarm off. 3. Press O to turn on the alarm. 1. Press 2nd MENU 2 .
does not change according to the names you stored. stored in Memo, Schedule and Anniversary files. make enough space to store new listings. depending on the situation of the other modes. See page 2 for operation. all of the data in each mode individually. <Example> Delete all listings in the TEL/MAIL1 file. 1. Press 2nd MENU NEXT 1 . 2. Press 1 to select TEL/MAIL1. “DELETE ? Y/N” is displayed. 2. Press NEXT 3 . “ALL SECRET DATA DELETE ? Y/N” is displayed. See page 9, “Designating the File Names” for operation. “12” (12-hour) or “24” (24-hour). unnecessary space in the memory of the Organizer. 1. Press 2nd MENU NEXT NEXT . 2. Press 2 to start freeing up memory. – When the power is turned on. with new ones then try again to free up memory. requires the optional cable “CE-260L”. displayed and no data transfer is allowed. connected correctly, and then start the steps again. with new ones then try again to transfer data. Organizer, then start the steps from the beginning. transferred on the transferring Organizer. 4. Press 1 on the transferring Organizer to select SEND. 5. Data transfer is started. • To interrupt data transfer, press ON . while data is being transferred. transferring Organizer is relocated to its original field. (VERIFY) on the receiving Organizer in step 3. 1. Press 2nd OPTION on both the Organizers. displayed, the backup data transfer is completed. the memory of its contents. stored in memory before replacing the batteries. explosion, strictly observe the following instructions. 1. Press OFF to turn the power off. 3. Remove the used batteries using a ballpoint pen or similar object. consumed batteries can alter or clear the memory contents. replaced or if the following instructions are disregarded. 5. Replace the holder cover and secure it with the screw. 7. Set the clock to the correct time. • Replace the battery every 5 years. before replacing the memory backup battery. 3. Remove the memory backup battery seal. 4. Remove the used battery using a ballpoint pen or similar object. 5. Install a new battery with the positive side (+) facing up. with Backlight for 2 minutes per hourly use. Backlight is on for 2 minutes per hourly use. CEE modifiée par la directive 93/68/CEE. Dette udstyr overholder kravene i direktiv nr. 89/336/EEC med tillæg nr. come emendata dalla direttiva 93/68/EEC. συµπληρώθηκε απ! την οδηγία 93/68/ΕΟΚ. modificada por medio de la 93/68/CEE.